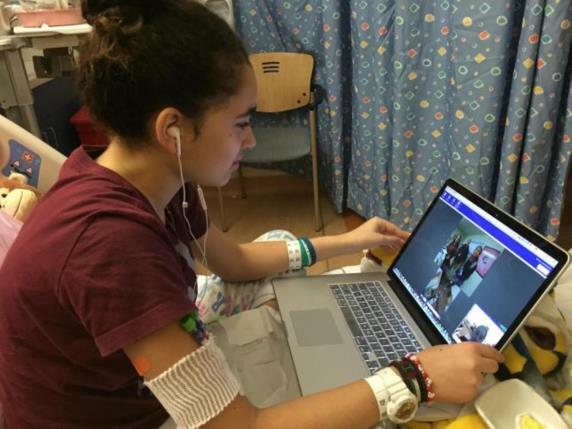 Naya Salah attends seventh grade from her hospital bed using the teleconferencing device Beam. Naya Salah kicked off her year at Stratford School’s Santa Clara Middle School as a typical seventh grader. She was a good student, she had a role in the school play, and she was very social. But everything changed Jan. 20, 2016. A few days prior, she didn’t feel well at school, and her friend told her her eyes looked yellow. On Jan. 20, doctors gave her the diagnosis — leukemia. Because the leukemia and chemotherapy would render her immune system depressed, Naya was told that she would have to miss the rest of the school year. Her classmates were shocked. But rather than wallow in the sad news, they decided to do something about it. A friend of hers, Eva Sandman, told her parents about Naya’s condition. Brad Sandman and Tanya Jenkins both work at Suitable Technologies, based in Palo Alto. The company makes Beam, a mobile videoconferencing device that can be operated remotely with a computer or a phone. The Sandmans spoke with their company and convinced them to let Naya indefinitely lease the Beam+. Within a couple of weeks, Naya was virtually attending classes through Beam, even socializing with her friends, while she was lying in the hospital or at home in San Carlos, getting treatment or recovering. The portion of the Beam+ that is physically present at Naya’s school in her place consists of a 10-inch LCD flat-panel screen, attached to a base with motorized wheels that allow it to move around through remote controls issued by the “pilot’s” device — a Windows or OS X device — running the Beam+ app. “It’s like an iPad on a stick,” Naya said. The device includes two HDR cameras, four microphones and a built-in speaker. It can roll at over 2 miles per hour and can connect to 2.46 GHz or 5 GHz WiFi networks. Naya’s Beam+ has been upgraded with an 8-hour battery, lasting the entire school day. (The standard version has a 2-hour battery.) After a day’s use, the pilot can drive it back to its dock to charge. 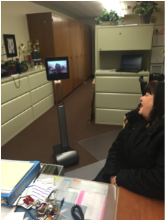 Beam works similar to Facetime: The user can see around her, and everyone looking at the screen can see the user. Naya uses her laptop keyboard or smartphone to operate the device at school. During the first few weeks she used Beam, other kids crowded around it, looking at it, commenting and interacting with her. Beam+ costs $1,995, according to the Suitable Technologies website. That includes the videoconferencing device, a dock, a power cable and a USB keyboard. Salah has been in the news before. She sang “America the Beautiful” in Arabic in a 2014 Coca-Cola TV ad that aired during the Super Bowl and the Sochi Winter Olympics. She was 10 years old and in fifth grade at the time, and she happened to be student body president of Palo Alto’s Stratford Elementary School. The ad generated some controversy, particularly among critics who said that song should only be sung in English. But Naya had a level-headed response: “America is one union but with a mix of cultures, and it doesn’t matter who you are. We should always be friendly to each other no matter what difference you have.” The controversy died down. Naya said her leukemia – or cancer of the blood cells – is not present in her system anymore. But she will have to keep taking chemotherapy for the next 2 ½ years.